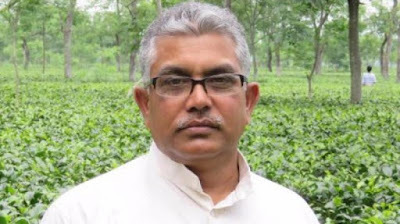 Kolkata: A day after the Supreme Court rejected elusive Gorkha Janmukti Morcha (GJM) chief Bimal Gurung’s plea for relief from arrest, state BJP president Dilip Ghosh has claimed that there were only an alliance and electoral understanding with him and his party. Distancing himself from Mr Gurung he made it clear that the BJP would not be responsibile for any other issue. Significantly it was Mr Ghosh who had rallied support behind Mr Gurung when the latter was booked in many cases of violence by the police during the unrest in Darjeeling. He had even accused the Mamata Banerjee government then of falsely implicating the GJM chief. Meanwhile, Mr Ghosh alleged that the non-BJP governments were taking credits of the central welfare schemes. “The central government is working for the people. It has announced 100 projects and released funds with an eye on the funds’ utilisation so that the common people can get the benefits,” he said. Mr Ghosh complained, “The work is underway in those states where our party is in power. But in those states where other parties are in power they are either not running those projects or running them only after changing their names. A day after the Supreme Court rejected elusive Gorkha Janmukti Morcha (GJM) chief Bimal Gurung’s plea for relief from arrest, state BJP president Dilip Ghosh has claimed that there were only an alliance and electoral understanding with him and his party.